Wait, what season is it? This photo is from last year at about this time. 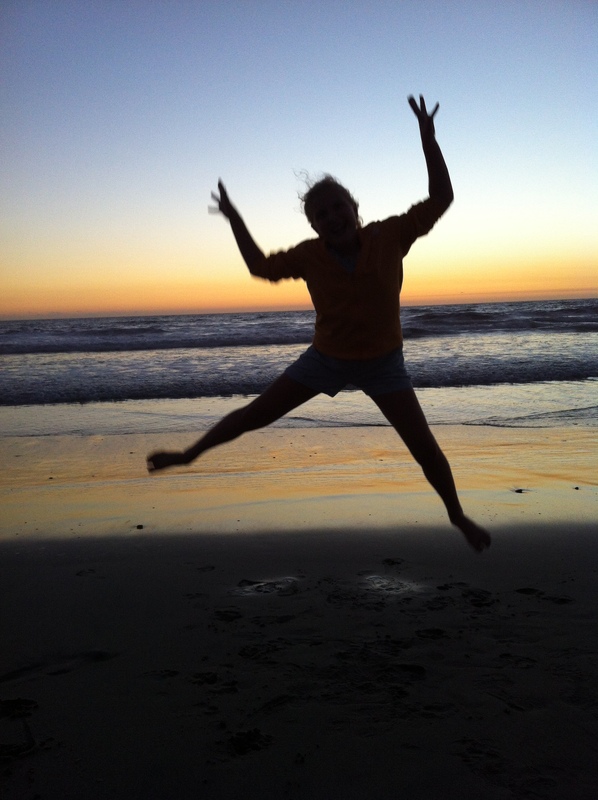 My daughter indulges my obsession with jumping silhouette pictures, fortunately. I hope she never outgrows the willingness to leap for the camera. As Thanksgiving approaches, I have a hard time feeling like Thanksgiving is approaching. The weather here goes from sometimes-hot in the summer to occasionally still-hot in the fall. It’s hard to know what season it is. The main difference in seasons as far as I can tell is the time of the sunset. These days, the sun sets at about 5 PM and it’s all but impossible to get myself down to the beach to watch it. That, my friends, is southern California autumn. To be fair, the nights do get cooler and sooner or later, the days might be chilly, but in general, this is such a mild climate. We all pretend to need a sweater from time to time, but those times are rare. Anyway, I put out some pumpkin decorations and soon I’ll put up snowmen decorations and a Christmas tree in an effort to make it feel like the winter holidays. But strange in the nicest way you can imagine.